Enoch Mandlenkosi Tshabalala’s family moved from Belfour, Mpumalanga to live in Johannesburg in 1945 when he was four years old. At first they lived in Kliptown, but they later settled in Soweto in the year that it was established on the periphery of Johannesburg. Soon after this Tshabalala contracted polio. After treatment at the Johannesburg General Hospital, he was bedridden for a long time. This was a major set-back in terms of his schooling. When he regained the use of his arms, his mother brought him coloured crayons and paper, and he began to draw his surroundings. He also took a keen interest in music. In 1959 he was employed to paint curios, and took on the job out of financial necessity. He was later encouraged to study under Cecil Skotnes (qv.) at the Polly Street Art Centre. 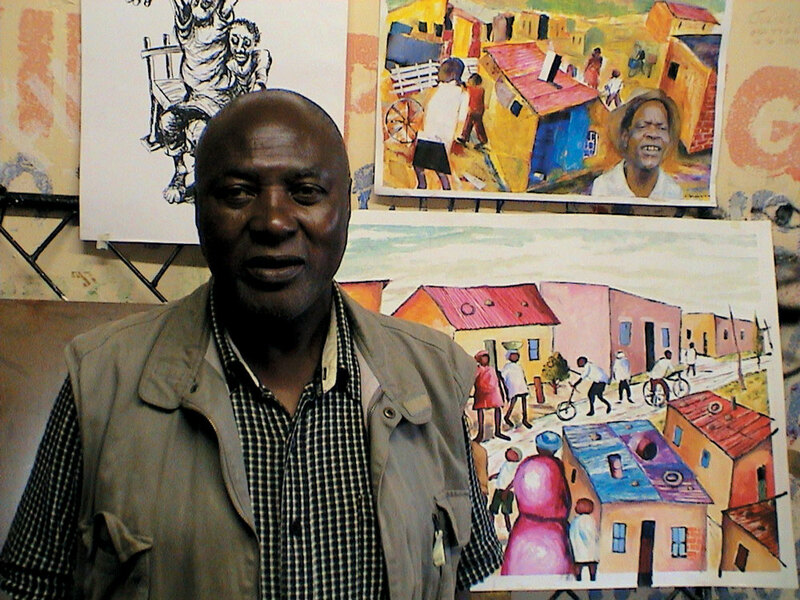 A major influence on his artistic career was his meeting with Dumile Feni (qv.) in 1964, and after this his style shifted towards Feni’s to a notable degree. This is evident in the attenuated expressionism in this single work by Tshabalala in the Campbell Smith Collection, titled “Number one dancer”. He launched himself as a full-time artist in 1966. Although he still wears calipers as a result of his illness, Tshabalala has managed to live a normal life. He has married and has four children and continues to live and work in Johannesburg. He now works mainly in watercolour and acrylic. Born Belfour, Mpumalanga, 1941. Training Educated at the Methodist School, Moroka. Exhibitions 1979: Art from South Africa/Art from Soweto, Bonn, Germany and touring. Collections Represented in various corporate and private collections. Photograph of Enoch Tshabalala. Courtesy of Prince Dube, Johannesburg. This work (plate 28) is an early pastel by Tshabalala that predates the dramatic change in his style following his first meeting with and exposure to the work of Dumile Feni in 1964 (See ReVisions, pp. 198-199, (plate 170). Unlike many generally later images of ‘township’ life which project a sense of activity using brighter colour, Tshabalala’s work seems more sombre, with a greater sense of realism. Dating from the early 1960s, it reflects the first springing up of informal settlements at this same time, created by the influx into the cities of job- seekers from the rural areas or those displaced by group areas legislation. The chaotic shanty-towns and slums which are now so much a feature of our present did not really exist before this, and were a new feature of South Africa’s urban landscape. Even the so-called ‘locations’ of earlier times were much more orderly by comparison.